Happy September! Last month saw us handling the curatorial duties for the ‘Best Of’ playlist, but we’re back to scheduled programming with more great guest curators, like this month’s guest, ie:music! As the digital revolution flourishes, ie:music is propelling itself to the forefront of the emerging technology, exploring and capitalising on opportunities for its artists. The company embraces digital technology as an extraordinary facilitator of artist – fan communications, as a means of encouraging transparency and of making everything from ticketing to downloading and streaming more effective, efficient and honest. They’ve picked 10 amazing artists for your listening enjoyment — check ‘em out! 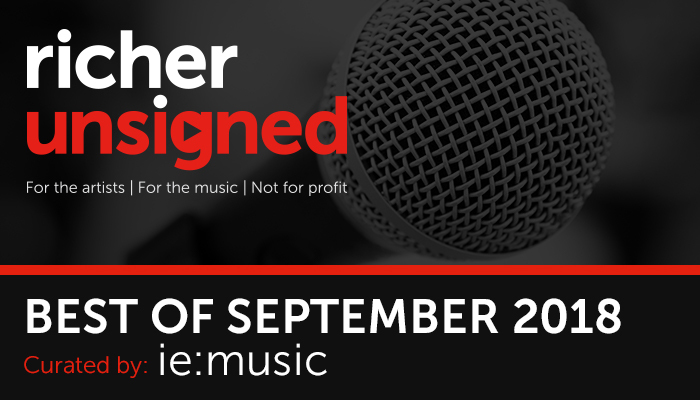 The post Best Of September 2018 by ie:music appeared first on Richer Unsigned.